Chess is played by millions of people worldwide. It holds a certain status to those who play it, often displaying their game boards as part of their decor. Woodworker and author Jim Kape takes this competitive mind sport to the next level, with 13 classic and modern designs of chess sets that are true conversation starters.Making Wooden Chess Sets includes patterns to create sets inspired by Paris, San Francisco, Henry VIII, and Neo-Classic design. The Berlin chess set will give chess enthusiasts and woodworkers a new viewpoint of the game with its vertical board that mounts on the wall. 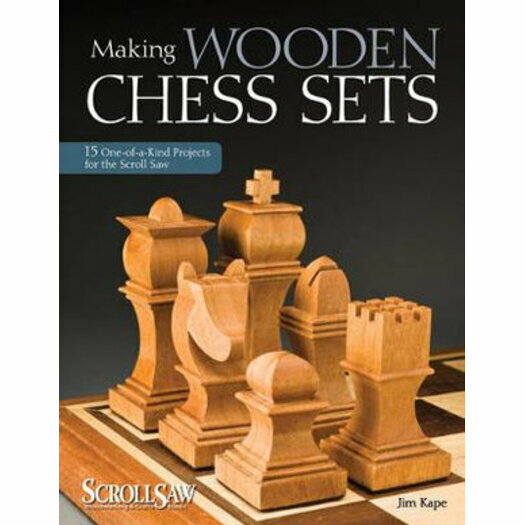 Also included - all the information needed to construct a handsome chess board, a travel chess set, and a range of storage boxes.With his use of beautiful exotic woods, and a high level of craftsmanship, Kape will have everyone from chess set collectors, to scrollers and woodworkers, interested in creating unique, heirloom-quality sets with this interesting book.